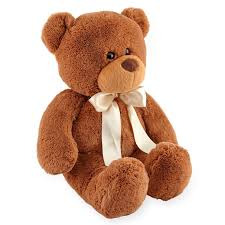 Add a soft teddy bear to any order. 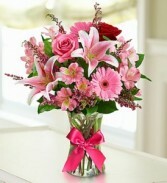 Pink lilies, red and pink roses, gerbra daisy, pink mini lilies, babies breath and greenery all hand arranged in glass vase. 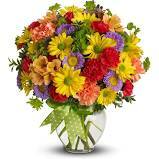 Yellow daisy spray chrysanthemums, purple Matsumoto asters, red miniature carnations, orange carnations and alstroemeria - are delivered in a ginger vase adorned with a green ribbon. 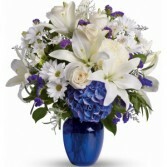 • Beautiful blooms such as blue hydrangea, crème roses, white lilies and alstroemeria along with white chrysanthemums, eucalyptus, limonium and more are beautifully arranged in a dazzling cobalt blue vase. • This arrangement will be hand designed.